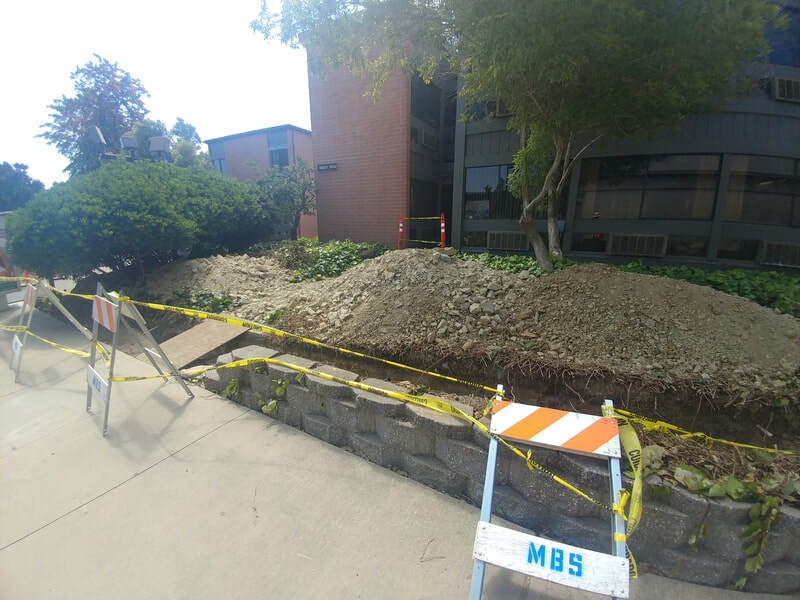 MBS performed a large Gas Infrastructure Upgrade Project for the Contra Costa County Community College District at Diablo Valley College in Pleasant Hill, CA, completing the project in the Summer of 2018. 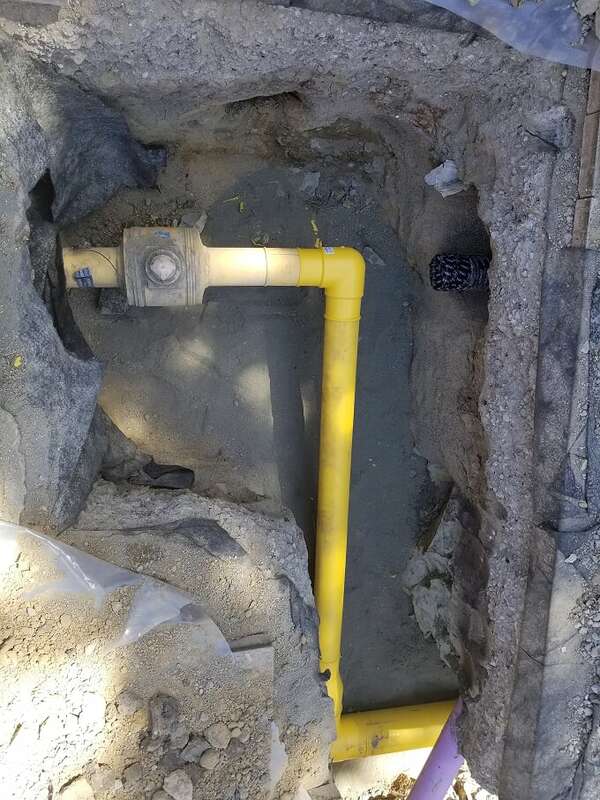 Working as the Prime Contractor, MBS was tasked with replacing and installing (9) underground isolation valves to better protect the gas system in place at Diablo Valley College. 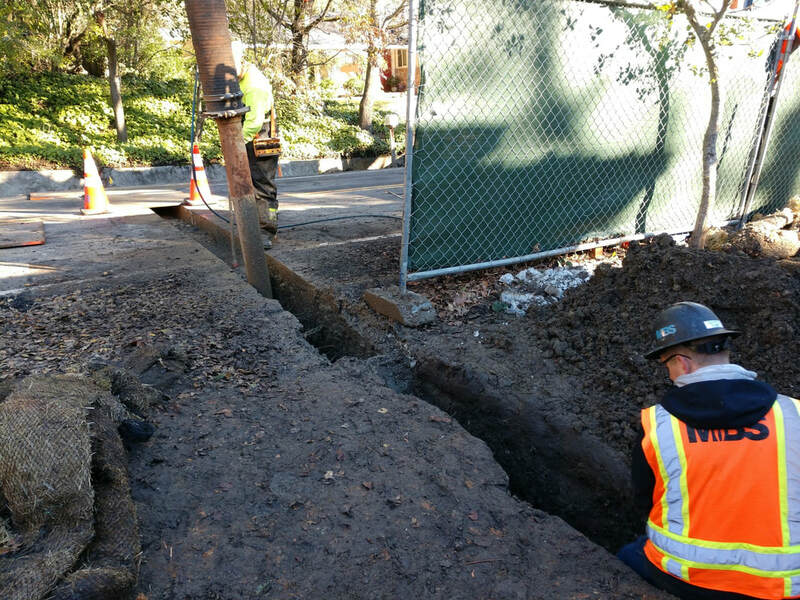 MBS also installed 450 LF of new 6” Polyethylene Underground Gas Line, making connections to (3) existing branch lines. 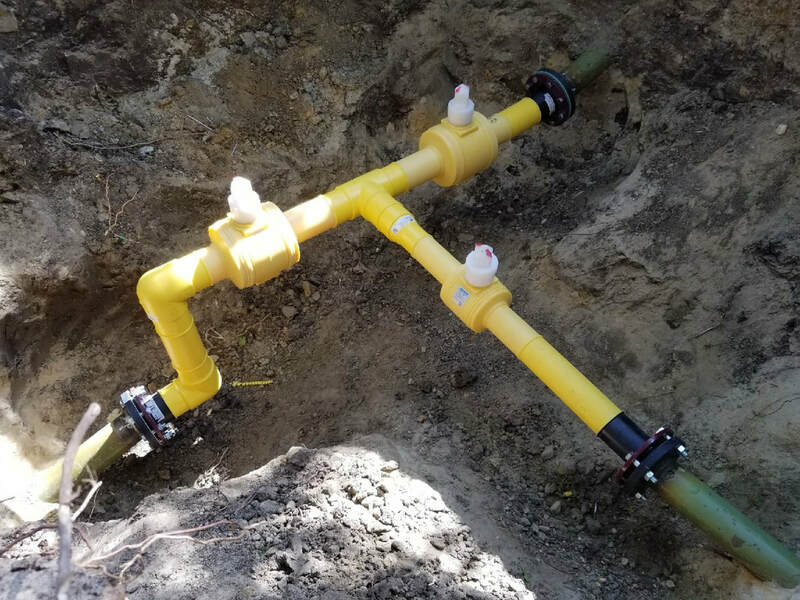 To complete the first phase of the project, installation of (9) underground isolation valves, MBS utilized professional utility locating, in order to positively identify the path, depth and location of the gas line at each location. Once the path was identified, MBS excavated each area, creating a 5’x5’ bell hole, down to 2 feet below the existing pipe/manual shut-off valve. Once all areas were exposed, MBS quickly evaluated each location to determine the best way to install a PE valve at these locations. MBS was given (2) shut-down windows to complete the installation of these (9) valves, completing (4) of the installations within a 6 hour window. The other (5) locations were completed on a separate shutdown day, completing these within in an (8) hour window. The most complicated valve replacement location was found within an existing gas valve concrete vault. The existing (3) valves at this location were located approximately 5’ below the surface. MBS was forced to remove the 6’x6’x6’, 12” thick Concrete Vault from this area as the weight of the vault was on top of the gas pipe. MBS utilized a large crane for the removal of this vault, and provided the demolition to haul off site. 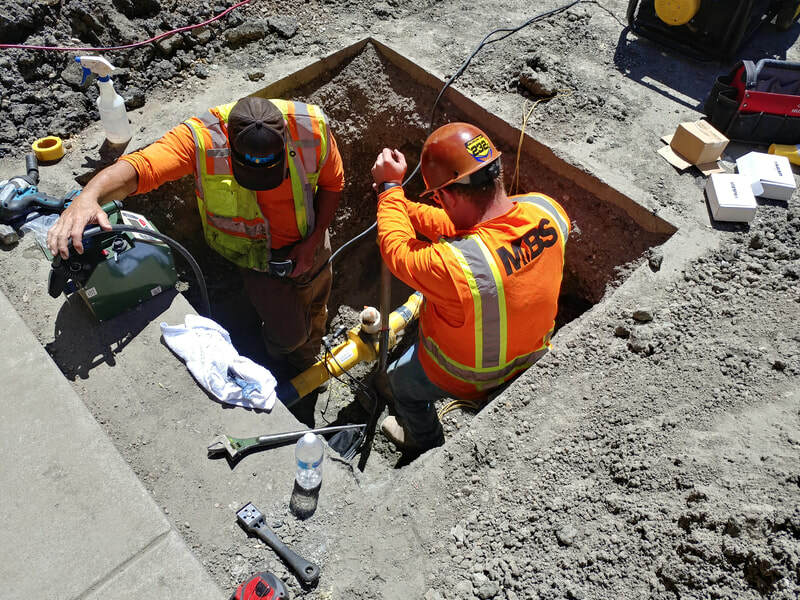 Once removed, and similar to all other valve installations, MBS utilized our certified PG&E PE pipe fusion crews to transition from the existing steel gas pipe to PE gas pipe, in order to accommodate the PE Valves to be installed. The second phase of this project involved MBS installing 450 LF of new 6” Polyethylene, Underground Gas Piping. MBS replaced an existing 4” Steel line that was in place previously feeding this portion of the campus. During the excavation portion of this project, MBS discovered a large portion of the trench was a tough sand stone material, making the digging very difficult and time consuming. MBS employed more labor in order to stick to the schedule provided and make quick work of this area. MBS also connected this line to (3) branch lines, using saddle style tapping tees for the connection. 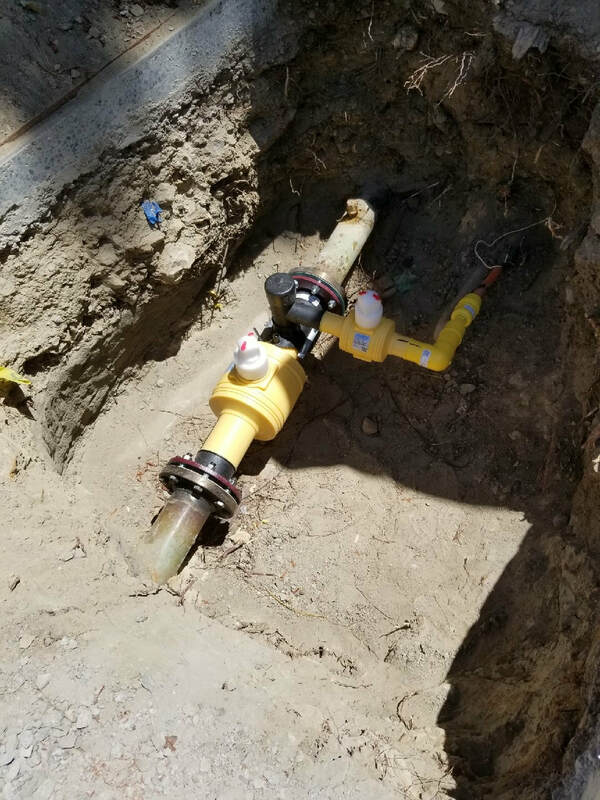 The entire installation was completed using PG&E certified installers, following the strict PG&E standards and procedures for installing 6” Underground Gas Piping. ​MBS Engineering worked as a subcontractor for DL Falk on their project to construct a new fire station in Lafayette, CA. 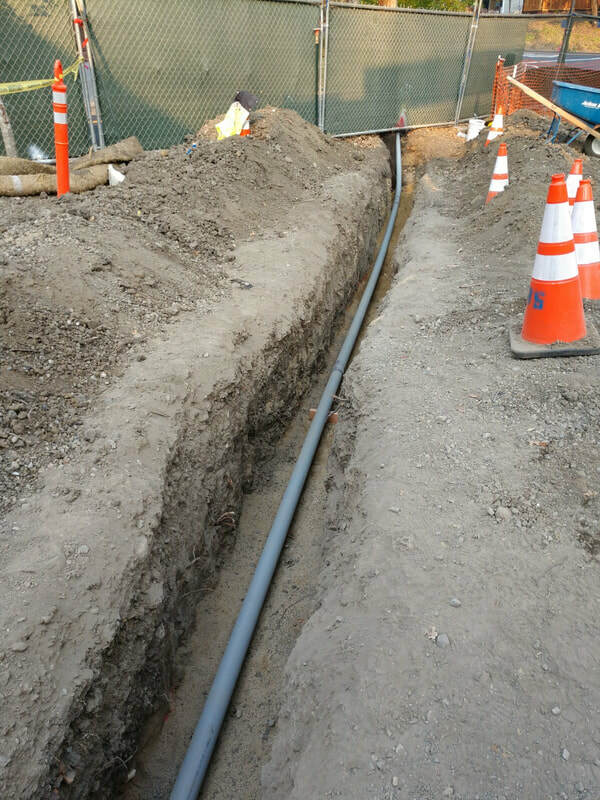 MBS Engineering was asked by DL Falk to install a new PG&E gas service line as well as conduits for electrical, telephone and cable service to the new building. 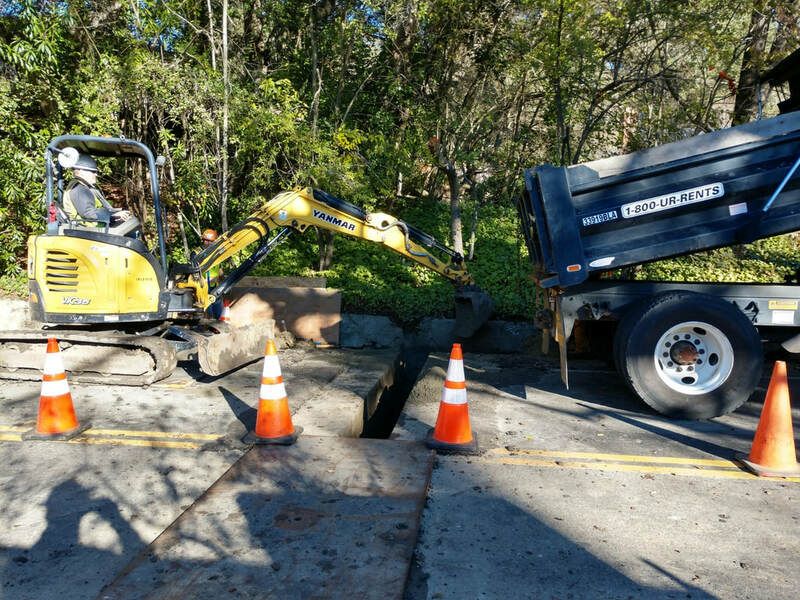 MBS Engineering handled the full scope of asphalt/concrete cutting, excavation, pipe/conduit installation, backfill, and resurfacing of the roadway. 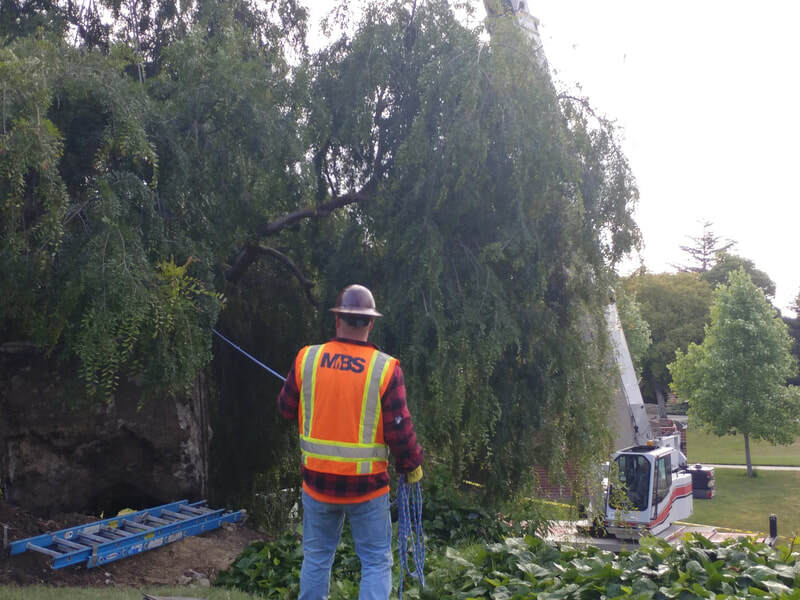 MBS worked diligently to safely complete the work as it traversed the road. All pipe and conduit installed by MBS passed PG&E inspection the first time without any rework required.